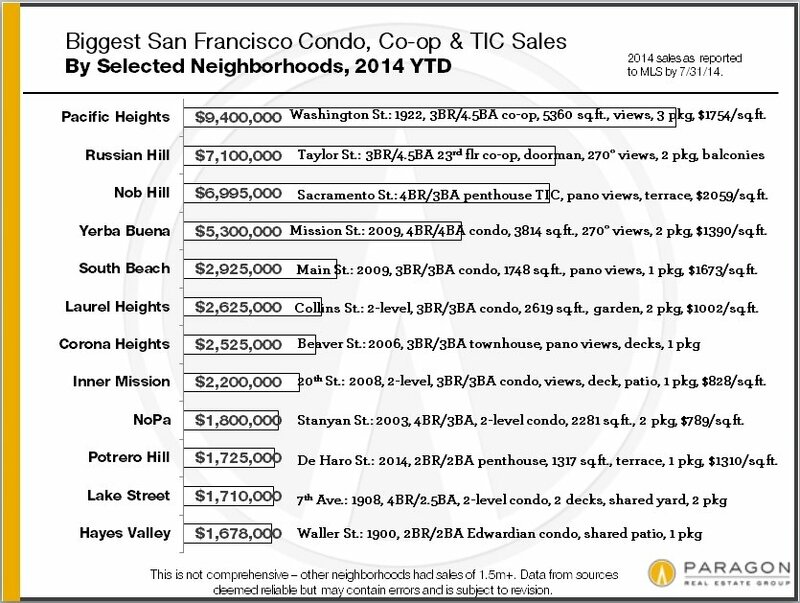 For your convenience, a map of San Francisco neighborhoods is included at the bottom of the newsletter. 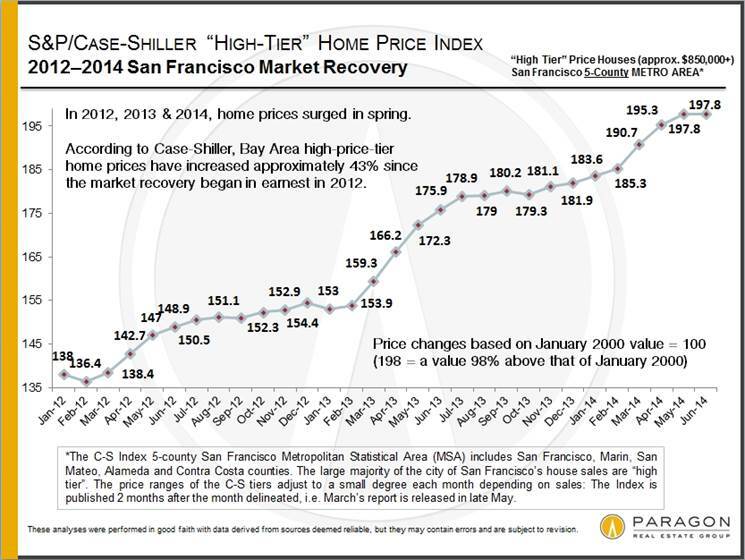 Adjusting your screen-view to zoom 125% or 150% will make the charts easier to read. 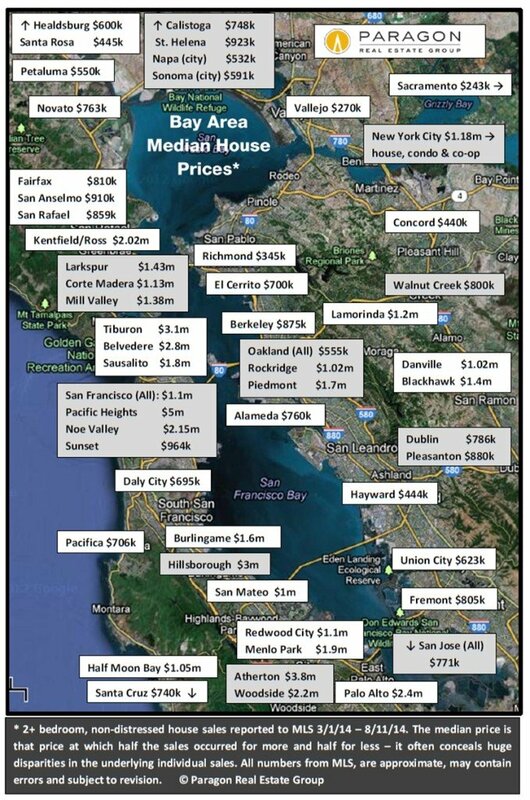 There has been a lot of chatter in the media recently about the median home price in San Francisco hitting $1,000,000. 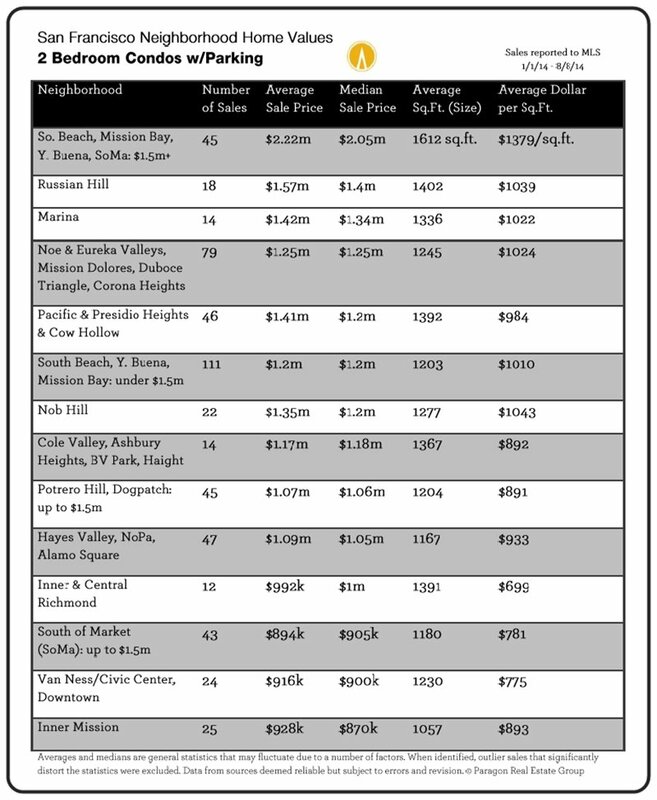 Here’s a look at the neighborhoods where one is most likely to find something under that price. 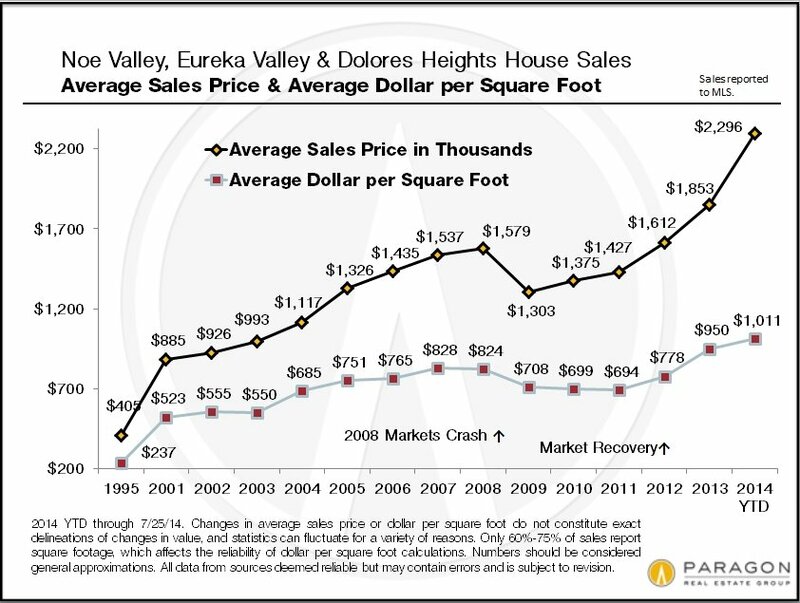 If one wishes to buy a house for less than a million dollars, choices are definitely shrinking with the recent, huge surge of appreciation – approximately 50% over the past 2.5 years. 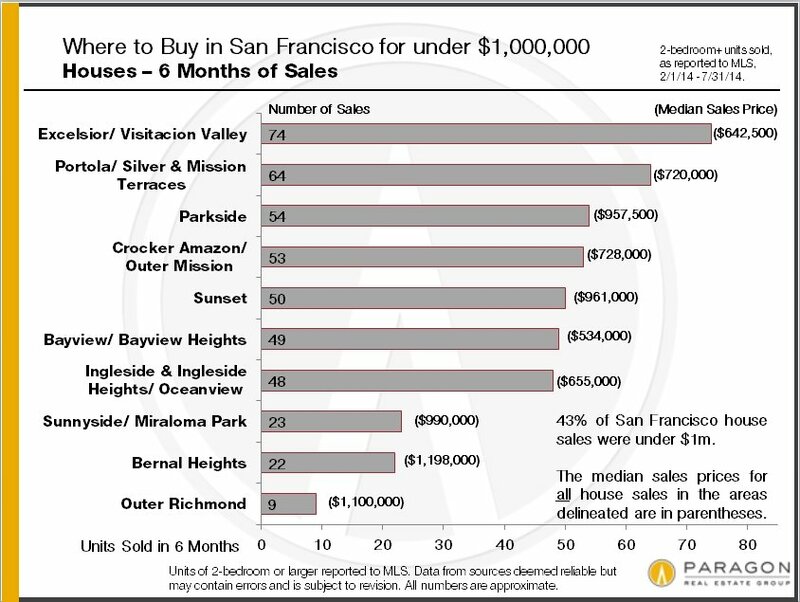 Neighborhoods like Bernal Heights, Miraloma Park and the Richmond district are quickly dropping off the list of options. The largest selection of affordable houses is now in the neighborhoods running along the western and southern borders of the city. 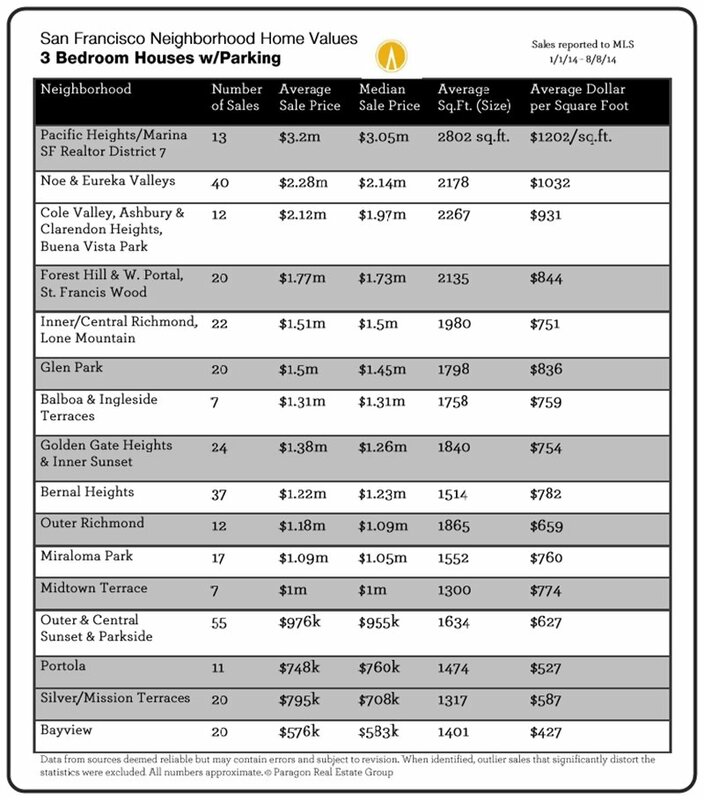 Looking for a condo or TIC under $1 million opens up a completely different and much wider array of neighborhood options in San Francisco. 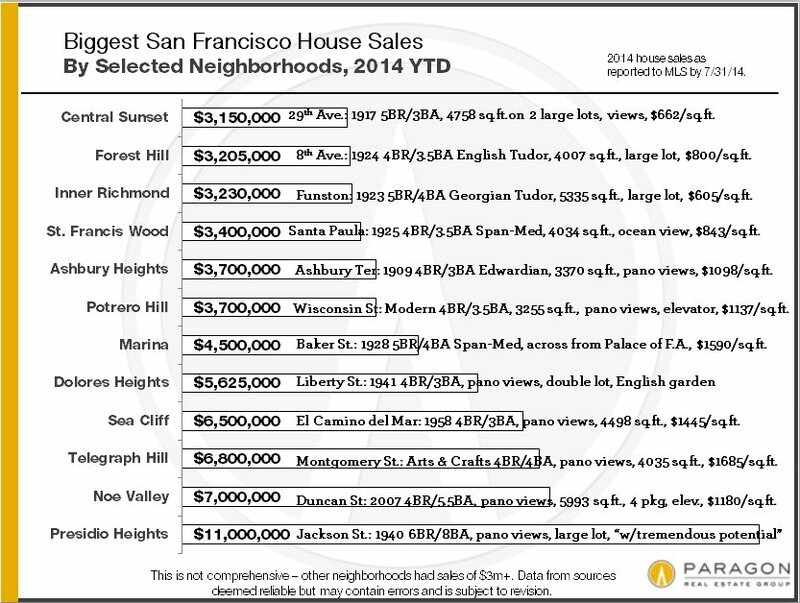 Needless to say, what one can buy at a particular price point may vary tremendously between neighborhoods. 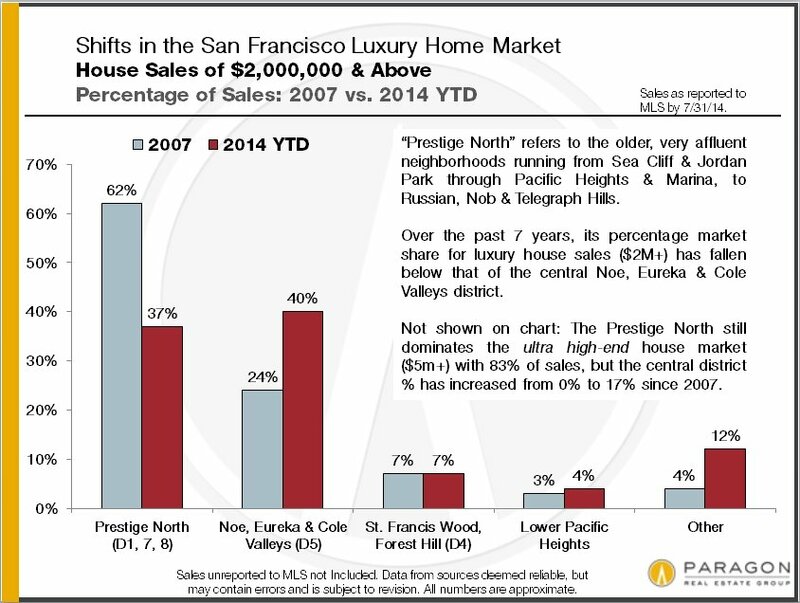 20 years ago, “San Francisco luxury home” referred to real estate in the northern band of old-prestige neighborhoods running from Sea Cliff/ Lake Street/ Jordan Park through the Pacific Heights/ Marina district, to Russian, Nob & Telegraph Hills (plus a few smaller enclaves like St. Francis Wood and Ashbury Heights). Those neighborhoods are still known for large, beautiful, expensive homes and, indeed, still dominate the ultra high-end. 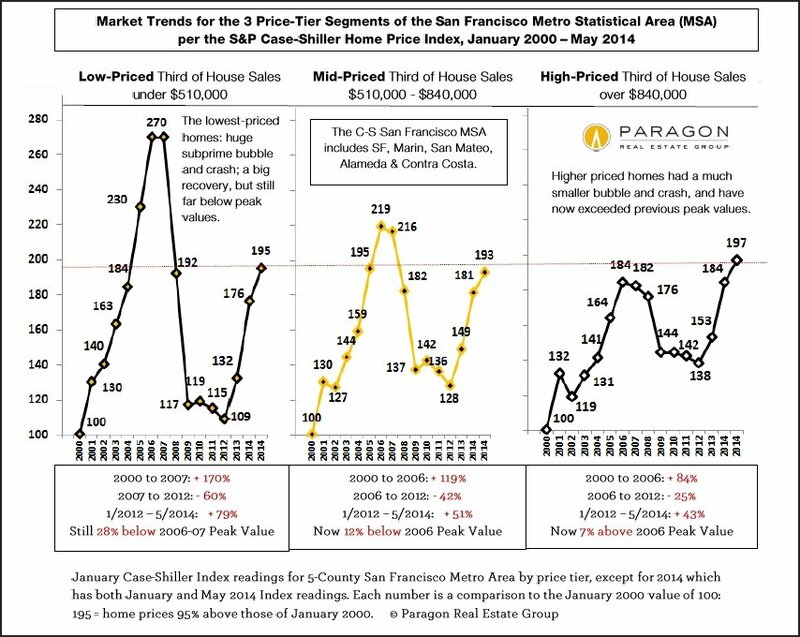 But other districts have developed footprints in the luxury market due to changing tastes and demographics, to the high-tech boom creating new centers of gravity for wealth (and changing commuting patterns), and to the formation of entirely new SF neighborhoods. 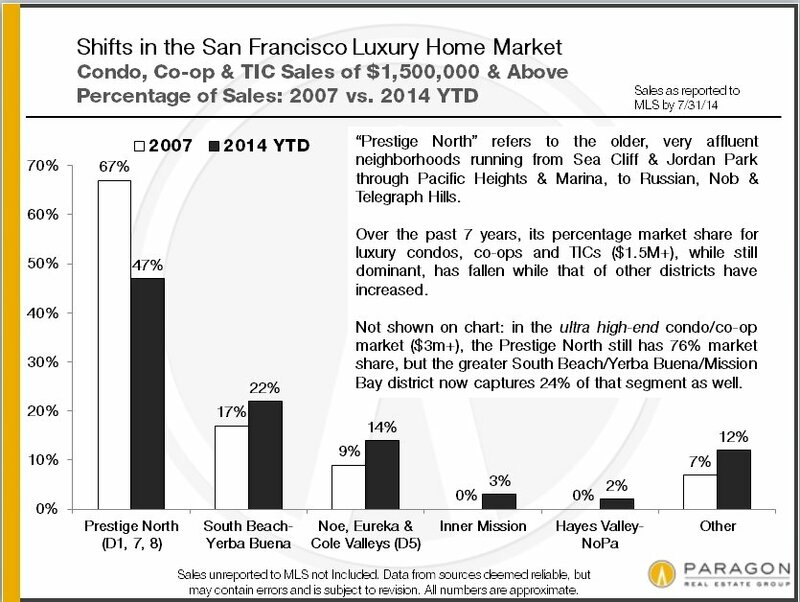 The general Noe, Eureka and Cole Valleys district (much of which was originally blue-collar neighborhoods) is now one of the most sought after areas of the city, and its prices have blown through the roof – more houses over $2 million now sell here than in all the prestige northern neighborhoods combined. 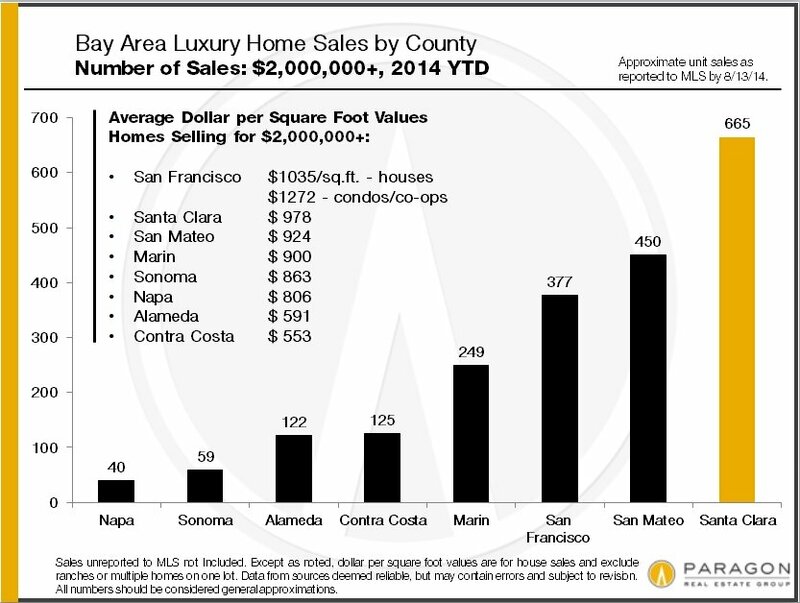 In the South Beach, Yerba Buena and Mission Bay area, some of the most expensive condo buildings in the country have risen from formerly B-class commercial-industrial wastelands. 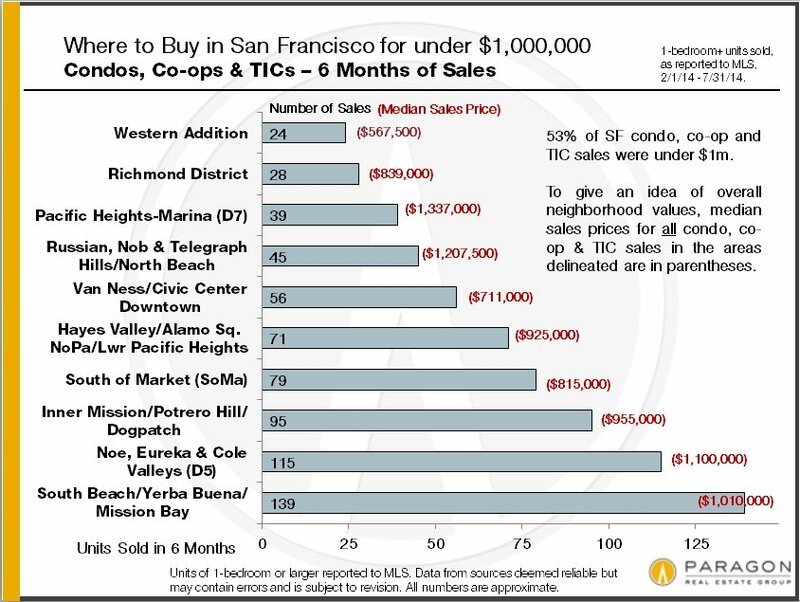 And most recently, new $1000+ per square foot condo buildings are beginning to pop up in places like the Mission, Hayes Valley and the Market Street corridor, catering to new, young, high-tech buyers. 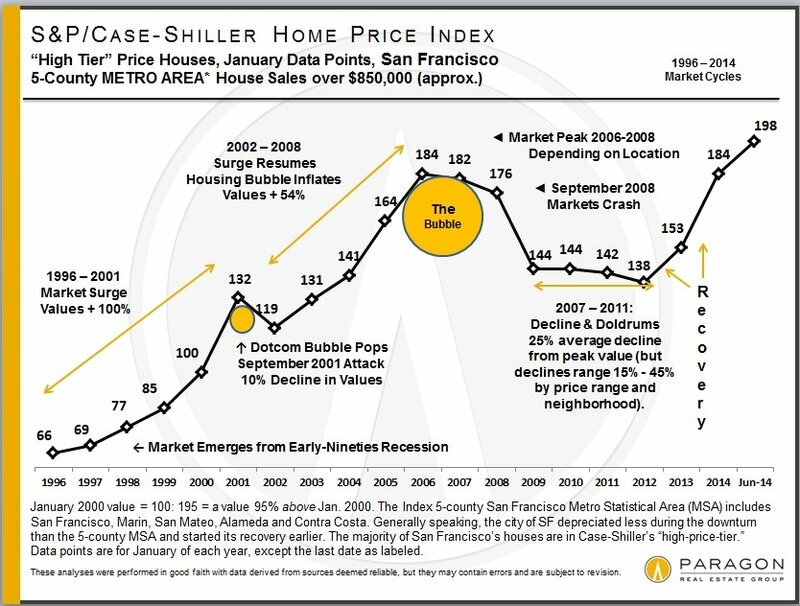 These two charts show the shifts that have occurred just in the past 7 years. 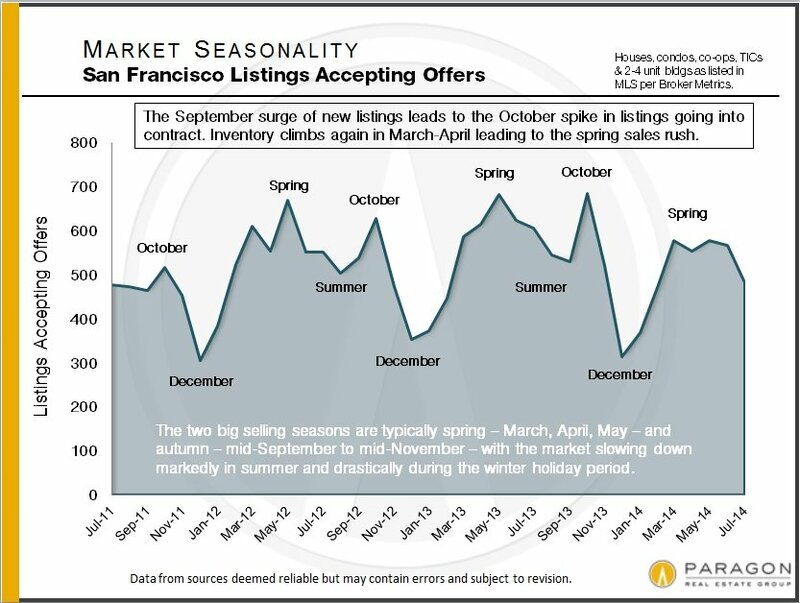 Believe it or not, this next chart, which shows an incredible percentage of San Francisco home sales selling for more, and often much more, than asking price, actually indicates a small cooling from May’s market. 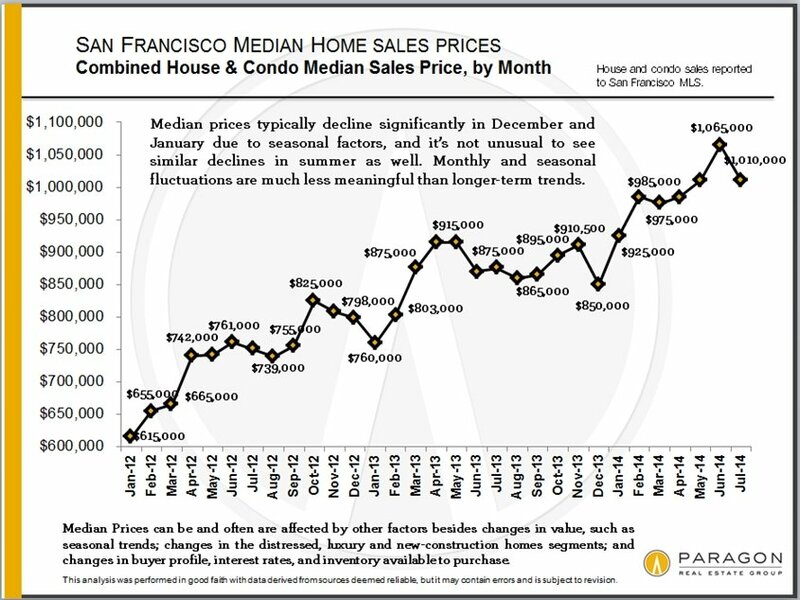 In May, 7% of homes sold went through price reductions before sale; in July, price reductions went up to 11%. 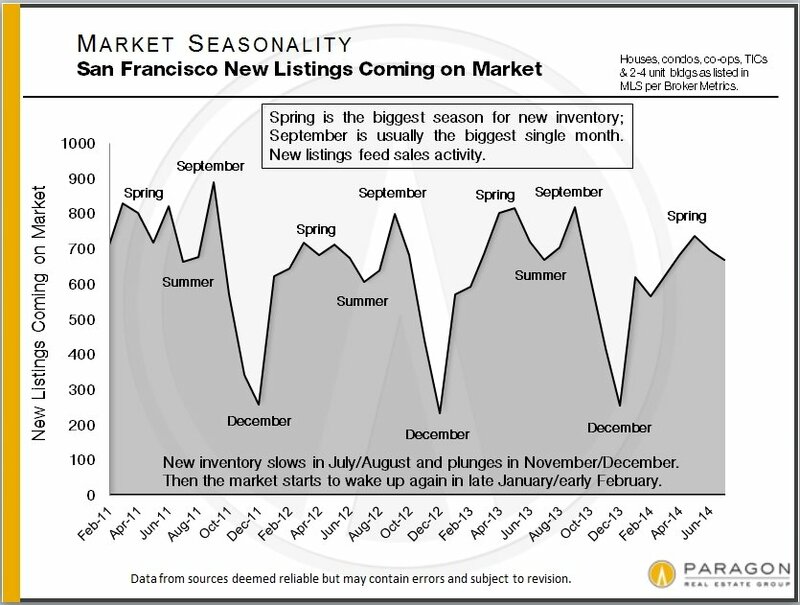 In May, the percentage of homes selling for 20% or more over list price was 29%; in July, that dropped to 24%. 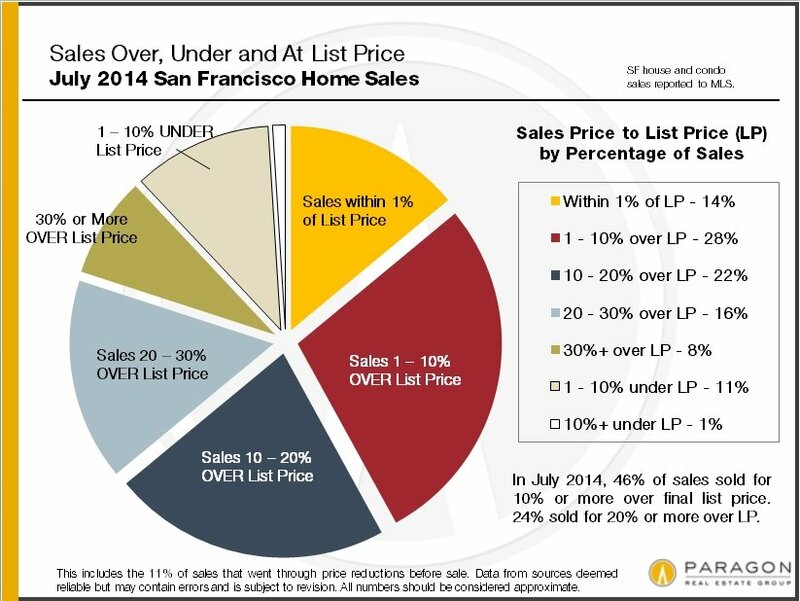 In May, 8% sold more than 1% under list price; in July, it was 12%. 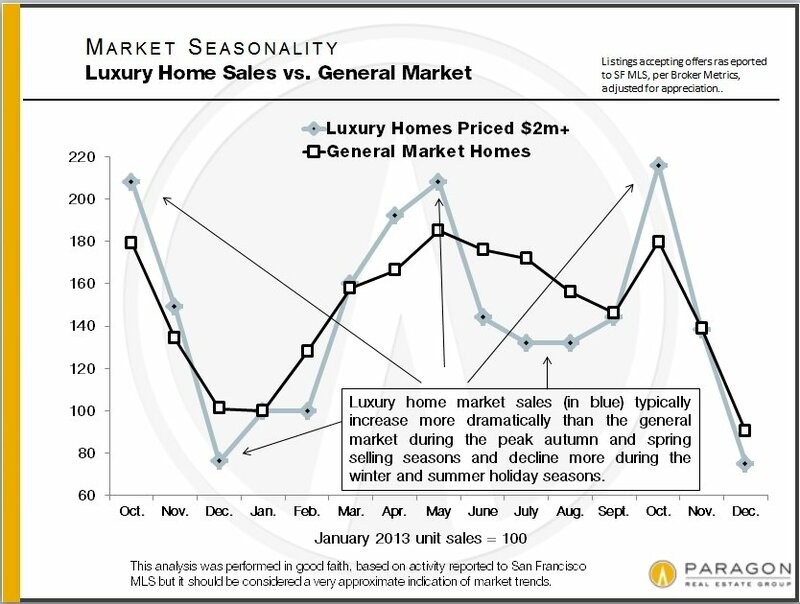 Most of July’s sales went into contract in June and if the market is cooling further, which is not unusual in mid-summer, it won’t show up in the statistics until later. 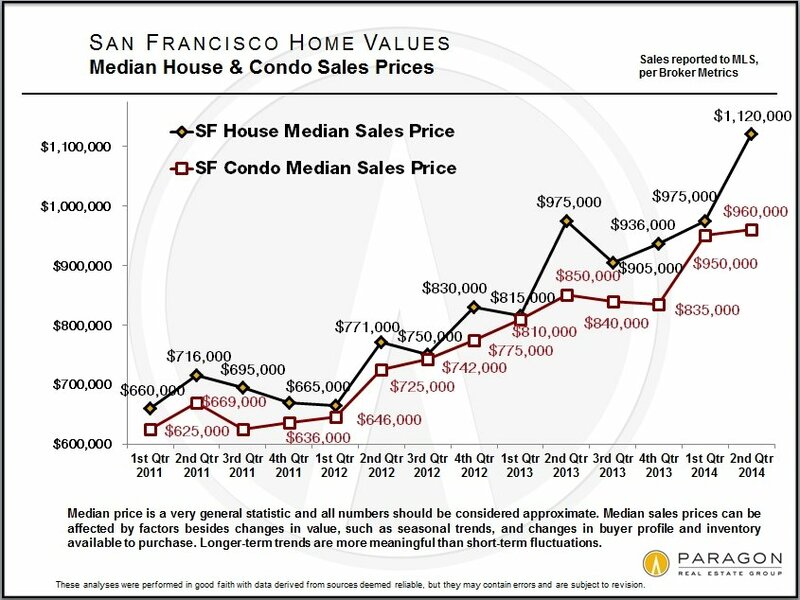 We recently wrote an article on the underlying conditions that, we believe, have given rise to our current real estate market, which can be found here: 10 Factors Behind the SF Market. 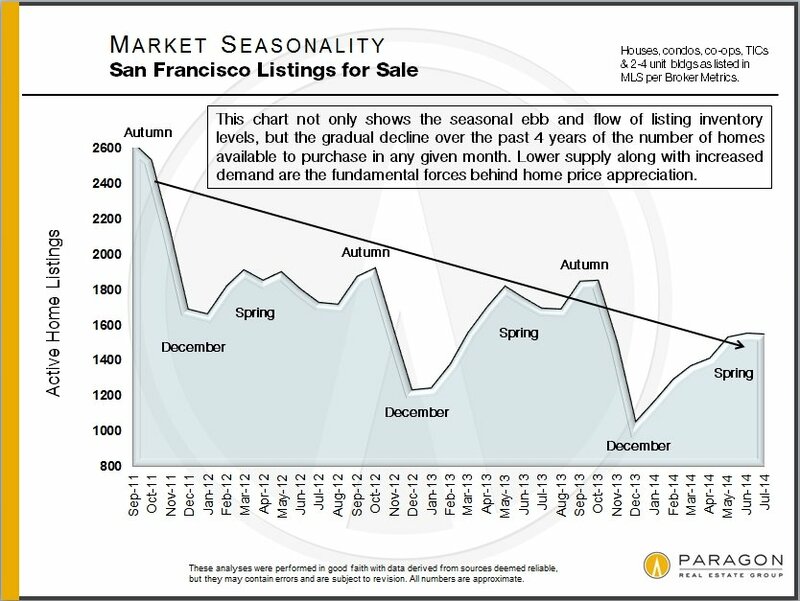 Our mid-year report on the Bay Area apartment building market is here: Paragon Apartment Market Report. And our recent update on the S&P Case-Shiller Home Price Index is here: SF Metro Area Case-Shiller Report. 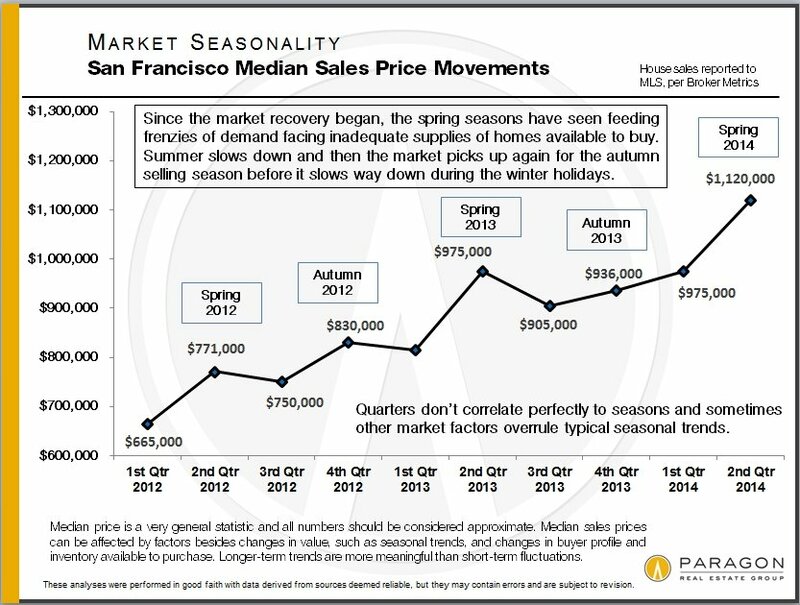 As is quite common, the overall median sales price dropped in July after the spring spike. 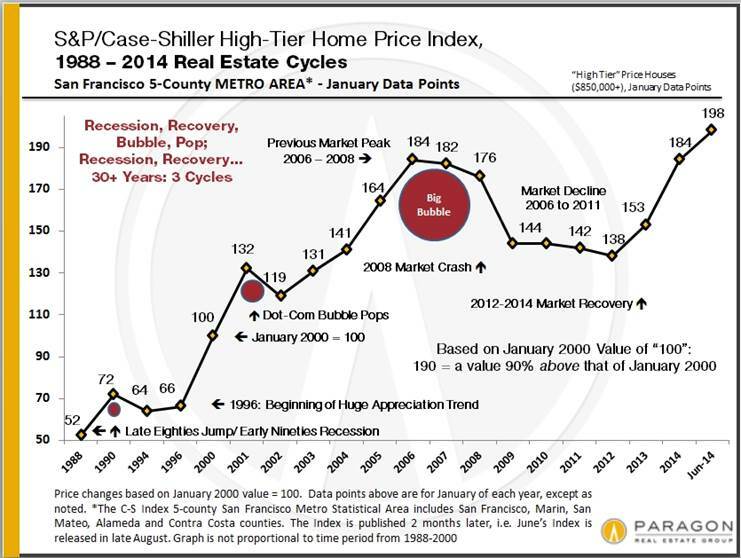 Such short-term fluctuations don’t have much significance until substantiated over the longer term. 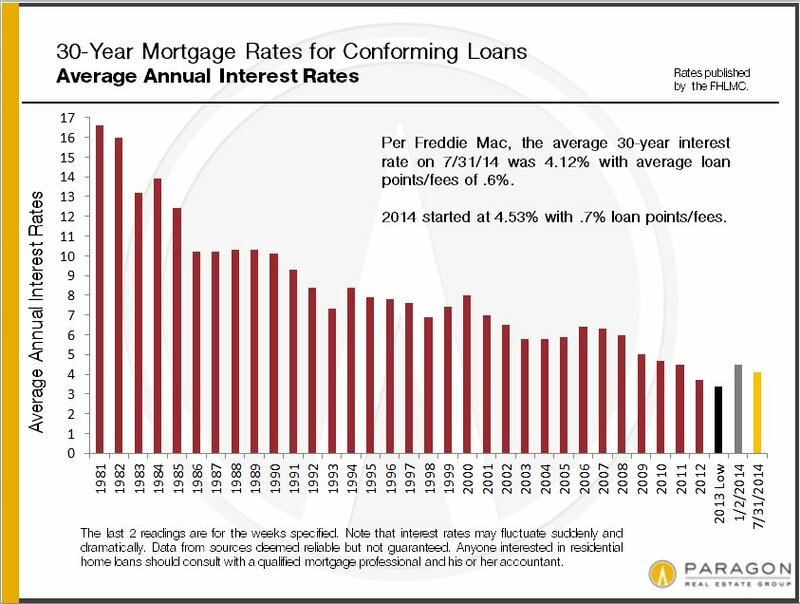 Interest rates, whose movements are famously difficult to predict, have for the time being remained very low – an important dynamic in the real estate market as people compare the costs of renting and buying. 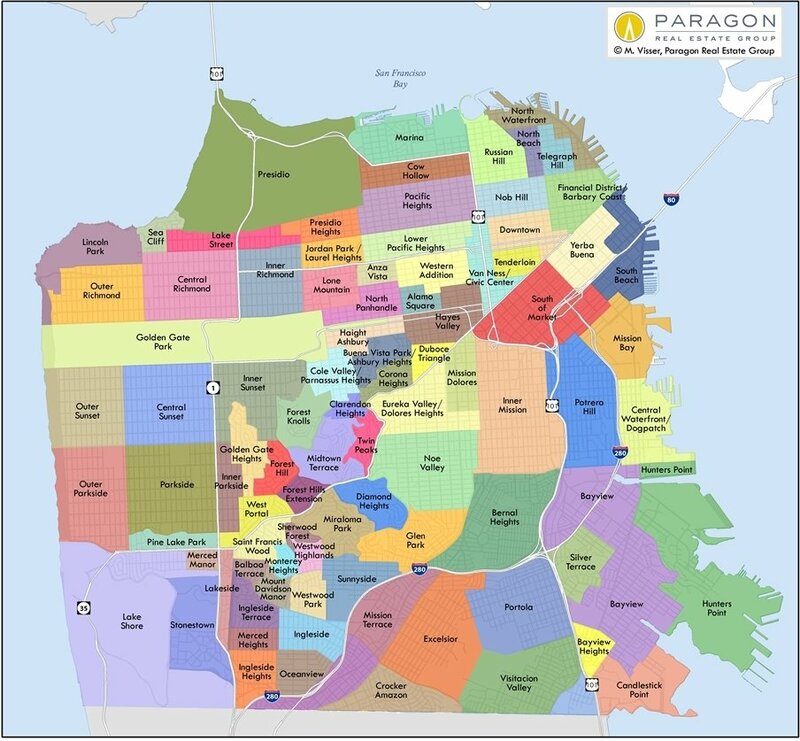 For your convenience, below is a map of the city’s neighborhoods.